Electronic cigarettes, also known as E-Cigarettes, Vapourisers and Electronic Nicotine Delivery Systems (ENDS) are cigarette substitutes that allow the smoker to inhale nicotine without inhaling the tobacco, tar or carbon monoxide. Basically, a liquid solution containing nicotine is vapourised into an aerosol mist which simulates the act of smoking tobacco. The liquid solution used in e-cigarettes can be sold in bottles as ‘e-juice’ or ‘e-liquids’ or as a pre-filled disposable cartridge. This liquid solution can contain nicotine in variable amounts (although nicotine-free solutions are available). E-Cigarettes are often hailed as being a healthier alternative to real cigarettes, however, they still contain nicotine and because nicotine is a toxic chemical, all electronic cigarette style products supplied in the EU must be labelled as ‘Toxic’ under CLP – the European regulation on Classification, Labelling and Packaging of Substances. E-cigarettes and e-liquids are regulated by several different pieces of legislation that cover their packaging, use and disposal but their classification is dependent upon the level of nicotine that they contain. Under the CLP regulations E-liquid mixtures containing over 1.7% nicotine are classified as ‘Toxic’; between 0.49% and 1.7% they are Harmful; and under 0.49% they are not classified at all. The European Union (EU) set up a regulatory framework for e-cigarettes as part of its broader revision of the Tobacco Products Directive (TPD), which regulates tobacco products within the EU. This came into force May 2016. Under the TPD, E-Cigarettes are allowed to be placed on the market providing the nocotine dose is less than 20mg/ml. If the dose exceeds this then they must be sold under medical licence and must be sold as an over the counter medecine such as nicotie gums and patches. The design of the label must ensure that the hazard pictogram and hazard and precautionary statements stand out clearly and are easy to read. Warnings must read horizontally when the package is set down normally. 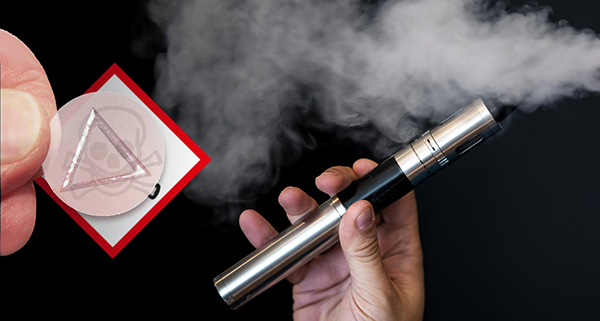 As nicotine is classified as a toxic substance, E-cigarette products must have child resistant packaging and they must bear the tactile warning labels to alert the blind and partially sighted that they are handling a hazardous product. Tactile warning labels must be applied to all products which are classified as toxic, very toxic, corrosive, harmful, extremely flammable and highly flammable, as well as to some aerosols classified as harmful, toxic or corrosive. The tactile warning must not be placed on surfaces which are removed during normal use, they are not required on outer packaging such as cardboard boxes protecting glass bottles. They must not be placed near any other embossed or raised patterns that could cause confusion. Where the packaging has a base, the tactile warning must be located on an upright handling surface near the edge and the apex of the triangle must be positioned within 50mm of the bottom of the pack (or as near as possible to the lid if there is no bottom). If the packaging has no base (such as tubes or cartridges) then the tactile warning must be placed on the shoulder around the tube nozzle. On aerosols, the tactile warning must be positioned where the finger is placed to operate the spray. If the warning is placed on plastic packaging with a full opening, it must be on the handling surface as near as possible to the opening. The tactile warning must remain tactile throughout the product’s expected life. Any E-cigarette products that are not labelled correctly, or don’t include the tactile warning label, are liable to be seized for non compliance with CLP Regulations. Are You Finding it Difficult to Manage the Rising Cost of GHS Compliance Software? range of pre-printed labels and related goods.